My name is Margot and I’m a mum of two lovely little girls, Sabine 3 and Elise 4, married and happily tucked away overlooking the water on the Central Coast NSW. I left school and fell straight into optical retail, which I stuck with for 18 years, but then I got married barefoot on the beach, shotgun style, and my life turned upside down. I sew and crochet for babies and toddlers. Being a crochet-addict, my main love is yarn – soft pure wool, alpaca and cotton being the favourites because they feel so lovely to work with and give such great lasting results. I impulse bought a bulk load of beautiful embroidery floss online not long after my second daughter came along, immediately fell in love with the shiny yummy colours and just HAD to make something. Three years later, my thread stash is still a favourite and I just wish I could find the hours to indulge in more embroidery. In the meantime, I use it to hand stitch details on my appliqué designs, which are hand drawn in my signature simple style. I also use my thread to sew detail onto my embroidery hoop designs, I love the way a little thread can add the extra texture and colour that brings each piece to life. I do think my children inspire me, but really inspiration can come from anywhere. I look at fabric and can see a giraffe or pirate ship or seahorse. Idea’s constantly pop into my head, it’s hard to reign them all in and maintain a cohesive look to my store ! I have baskets with different projects stashed all over the house, so I have many on the go at once. 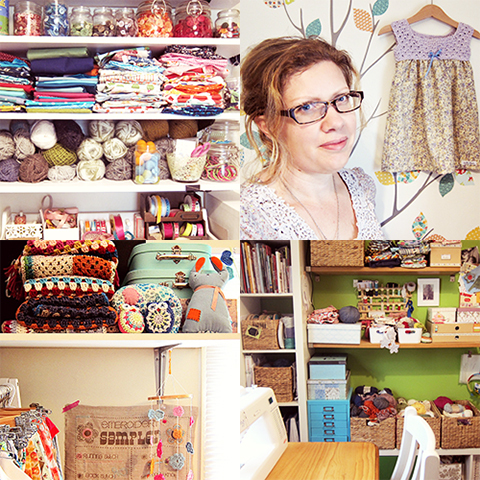 My standard rule is – studio & sewing during the day, couch and crochet (and tea and chocolate!) at night. I arrived home from hospital with a new baby to find my mother had bought me a sewing machine. It took me 6 months to go near it (and I had to google what a bobbin was!) but my Mum must have known – have a little girl, you will want to sew !! I’ve always been creative and tried my hand at making various things. I enjoy working with my hands, but never found the right ‘thing’ for me. Then I found myself stuck at home with 2-under-2 and found sewing and crochet into the wee hours helped my sanity. A lot. I was never happy with the choices for little girls in the shops (well, not the ones I could afford ! ), so I set about learning to make them myself. My clever sewer/knitter/crocheter/clever Mum would come to visit and teach me a new skill every time and everything just clicked and felt completely natural to me. lolli & bean is almost three years old now and I can’t imagine NOT doing this each and every day. I discovered this handmade world, and found a whole community of people. People just like me. I started out making canvas nursery art and small bits and bobs for babies and thought ‘little pretty’ was a good name. But it seemed really girly and I didn’t want to force myself into a particular category. My girls nicknames have always been Lolli and Bean and when I found myself saying it over and over, I soon realised it was the perfect name for me, given that I would not have a handmade business if it were not for my girls. The web has just about everything you need as a crafter, from blogs to tutorials and don’t even get me started on Pinterest ! For any kind of crochet advice ravelry.com is amazing. I’m a book lover so have a growing collection of lovely crafty books which I can go to for tricky stitches or techniques. Or just to gaze at the pretty pictures. Last year a friend invited me to an embroidery workshop at ‘Prints Charming Fabrics’ crafty warehouse, which was insanely inspiring ! I’m planning on going back for a screen printing workshop one day. Also the handmade community is the best ! When you work from home alone, it’s important to connect with that community, for advice, friendship, camaraderie and support. There is always someone there when you need them ! I think it’s important to find your own ‘voice’ and niche and remember to be yourself. It’s fine to be inspired by others work, but do what YOU love, in your own style or way. Remind yourself that if you have to make a particular item 100 times, are you still going to love it ?? It’s also important to value yourself and your work, which means price accordingly and take pride in your work. I think ‘handmade’ should equal quality, not mass produced. So allow your products to be individual and unique but pay attention to the details, that’s what will set you apart. And if you can’t take good photo’s , take the time to learn. Bad photo’s are just not OK, especially when there are so many fab (and free !) photo editing options. Social media can be amazing, you need to have a presence and let your customers into your handmade world. For me, local markets have been awesome for getting to know my customers and building confidence. Advertising should be built into your monthly budget, however little that may be. There are so many affordable options, it’s worth hunting around to find the best ones for your business style. I’ve not had many disasters as I’ve grown my business very slowly and methodically. I think learning to say ’no’ is a lesson learnt though. You can’t be all things to all people. If you don’t have the time, the skill or the want – don’t do it. ummm...on my ‘day off’ I did some sewing for my girls ! I do love my garden, a bit of weeding is good for clearing my mind. I love to renovate & decorate, my house is a constant project ! I’m a bit of a roadside-finds hoarder and ebay queen, with a garage full of furniture patiently waiting for a bit of up-cycling. As a family, we love camping and invested in a camper trailer earlier this year. Nothing better than a beachside campsite, a good dose of nature, happy children playing and a glass of wine (or few) for me. Music - I love music I can sing too, whatever genre that may be ! Old favourites are Powderfinger and Jamiroquai. Film – Amelie is still, and may always be, my favourite. I loved every little bit of it. Otherwise, give me a rom com and I’m a happy girl ! I don’t do scary !! I don’t get enough sleep as it is, nightmares won’t help ! Book – Lee Child’s ‘Jack Reacher’ series. Oh dear. I’m a sucker. It’s a not-too-hot sunny day that involves a breakfast (cooked by someone else), happy children (no fighting, absolutely no squealing), a water view of some description, no housework or washing, nice wine at some point, a delicious dinner (cooked by someone else) and lots of chocolate (that contains zero calories but still tastes amazing). flotsamandjetsum - I’m a bit in love with ‘Flotsam and Jetsum’ – style, patterns, colours, contrasts, gorgeous !